Product prices and availability are accurate as of 2019-04-19 03:03:27 EDT and are subject to change. Any price and availability information displayed on http://www.amazon.com/ at the time of purchase will apply to the purchase of this product. The GoControl Premium Z-Wave Home Security Suite pairs with a Z-Wave Hub to create a customizable, expandable home security system. The suite includes 3 door/window sensors, 1 siren/strobe and a motion sensor. Once the system is assembled and connected, you can survey activity and control reactions via the hub's app interface. You can expand your system with additional sensors, door locks, light switches and dimmers, and other peripherals. You can sync sensors to other products to trigger actions, such as a light turning on when motion is detected. 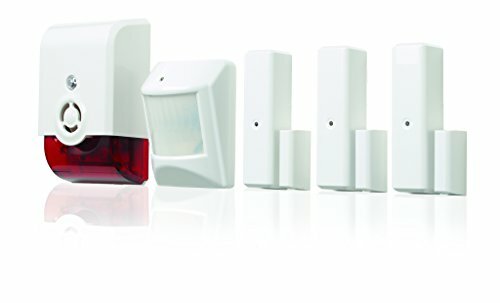 Pairs With A Z-wave Hub To Create A Customizable, Expandable Home Security System Monitors Activity & Controls Reactions Through The Hub's App Interface Expandable With Additional Sensors, Door Locks, Light Switches & Dimmers Sensors Sync To Other Products To Trigger Actions Such As A Light Turning On When Motion Is Detected system Includes: GoControl D/W sensors are easy to install; Monitor doors, windows, medicine cabinets and safes; Alerts are sent via in-app push notifications GoControl motion sensor is easy to install and is perfect for detecting movement in hallways or rooms; Alerts sent via in-app push notifications The GoControl Premium kit comes with a 90dB indoor siren; the siren is equipped with a flashing strobe in addition to a piercing audible siren Adding GoControl sensors to a hub is easy; insert the battery to the sensor; open your app follow on screen instructions to add sensor to network The GoControl Premium kit allows for easy expansion to include more sensors, cameras, door locks etc.